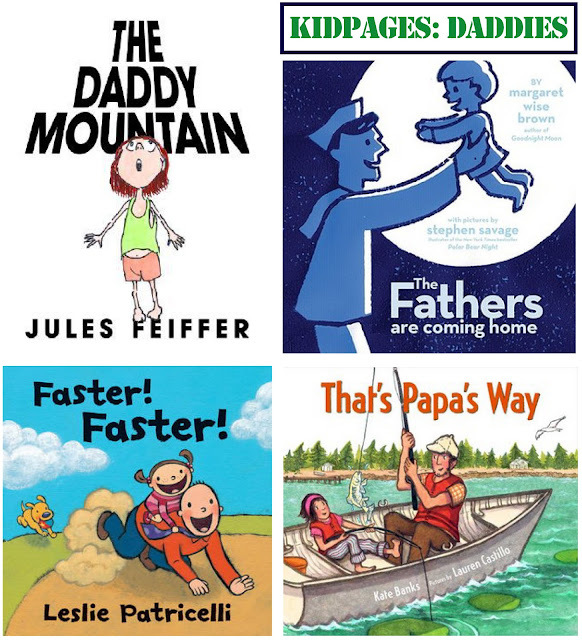 With Father's Day just around the corner, I thought it would be appropriate to share a few of our favorite picture books that give the spotlight to dear ol' Dad. I hope you enjoy them! What is it about kids and climbing? Or are my kids the only ones? They're like little monkeys. (Bradley nearly gave me a heart attack a couple weeks ago when he scaled to the top of a six-foot fence and almost made friends with a cow at a farm we were visiting.) But perhaps nothing is so inviting as their tolerant, patient dad. That's what this book is all about: a little girl trying to make it to the very top of her own tolerant, patient dad. She begins at his feet and narrates the arduous climb with detailed instructions: "I have to be brave. I crawl up a leg of the Daddy Mountain. I hold on tight and go not too fast. It's harder than you think." She eventually makes it, and victory is hers...until her mother sees her. I am annoyed by one small thing about this book, and that is that it feels like a couple of the pages had to be added in because the book wasn't long enough to meet the standard page requirement for picture books. I won't mention which ones; you just get the book for yourself and see if anything stands out as unnecessary and redundant. Maybe I'm crazy. I love the illustrations. For most of the book, the dad (aka, mountain) is still and immoveable, gray and granite-looking. Since the book is narrated by the little girl, we see her dad through her own eyes--and she is so lost in the intensity of her climb that she really sees him as an obstacle to be overcome (although she does have the presence of mind to remember that if she grabs his skin (instead of his clothes), he will get mad). The real reason I love it though is because I have seen my own three boys treat Mike like a mountain--sometimes alone, sometimes all three together (if it's a group hike). I am so happy that a talented author/illustrator observed this favorite past time of children and decided to capture it with words and pictures. Lest you be fooled, this book is not about a father coming home from war. Maybe it's just me, but when I first saw the cover and the title, I totally thought I was going to find a story about a Navy father returning home to his young son after serving in World War II. But, no. 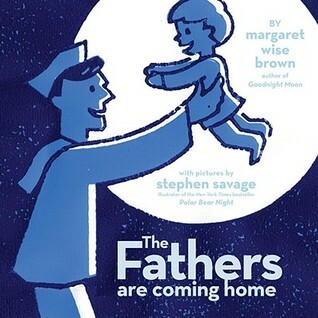 Instead, this book is about a wide variety of fathers returning home to their children after a long day's work. There is a fish father and a rabbit father, a bird father and a dog father. And yes, at the end, there's a sailor father who "comes home from the sea, home to his little boy." One of the things I found so interesting about this book was that, and I quote, "the lion father lives alone, so he comes home to himself." I wasn't disturbed that they showed a father who didn't come home; certainly nature is full of fathers who are totally oblivious to the fact that they even have children. I just thought it deceptive that the lion was singled out as the anomaly, the one and only father who does not care anything about his young, when the book also features a fish, ladybug, daddy longlegs, and snail, all of which, I'm pretty sure, have absolutely nothing to do with their offspring. I just don't really understand the point of the lone lion. Aside from that, the book is very sweet. There are so many sentimental books about mothers (too many, actually, for my tastes), so I really liked seeing the dads get some of that attention. And this is a sentimental book that actually holds the attention of my kids, which is very rare. It jumps from animal to animal, and so they're kept busy anticipating the next one instead of yawning with boredom. The illustrations are simple, mainly silhouettes, which complement the "end of the day" feeling of the book. I don't think there's any part of the day that my boys anticipate more than the fifteen minutes every evening when they're watching for Mike to round the corner on his bike. This book perfectly captures that joy. I'm not ashamed to admit that I'm a huge Leslie Patricelli fan. It took me a couple of tries to really warm up to her style (and I still can't say that I love The Patterson Puppies series), but now I'm hooked. Most of her books contain very little text (I think The Patterson Puppies are the only exception to this, which is maybe why I don't like them as much? ), and I am consistently amazed with the wit, insight, and creativity she expresses on each simple page. Faster! Faster! is a perfect example. A little girl begs her daddy for a ride. He gets down on his hands and knees, she grips his necktie in her small hand, and they're off. With her cry of "Faster! Faster!," he picks up speed, and soon she is racing away on a "dog." Then she challenges him again, and with a new burst of energy, she's on a "rabbit." They make their way through a series of faster and faster animals until suddenly she is on a "turtle" and asking, "Faster? Faster?" At that point, they flash back to reality where the daddy is collapsed on the grass, his tongue hanging out in obvious fatigue. But it is enough for his little girl who happily exclaims, "You're fast, Daddy!" As with The Daddy Mountain, this book celebrates how much fun it is to play with Dad. I'll be honest: I don't give my kids a lot of piggy- or horsey-back rides. Sometimes. On occasion. But not a lot. But Mike? It's pretty much a nightly activity, and Aaron, Maxwell, and Bradley live for it. There is something so different in the way the two of us play with our kids, and they definitely seem to thrive on the variety. I also love the way this book races through the animals. Each page shows the animal the little girl just abandoned (panting and worn out), the animal she is currently riding, and a hint of the animal that's coming up next. It's such a great way to engage my 20-month-old. 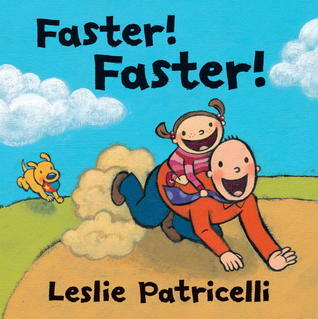 I'm convinced that anyone who says board books can't be great literature (or great entertainment, for that matter) has never read Leslie Patricelli. This story is narrated by a little girl who goes fishing with her papa one day. She describes their adventures from sunup to sundown: the worms they dig out of the ground, the way her papa whistles as he rows the boat, the waiting, and the first catch of the day. She makes note of the things they do differently but also the really important things that they do exactly the same. Throughout the story, the little girl frequently makes the observation, "That's Papa's way." Because this phrase is repeated several times, the story could have easily become formulaic and fallen into a predictable pattern of, "we did [such and such] because that's Papa's way." But it didn't. 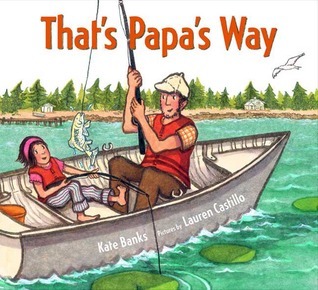 The repetition of "That's Papa's way" ties the story together but doesn't dictate how the story is told. I love the illustrations, which, to my untrained eye, appear to be done in colored pencil and watercolor. This mixed media has the effect of softening some edges and sharpening others, and even though my lack of artistic talent renders my opinion completely negligible, I still think they're really lovely. I was instantly endeared to this book because I've always called my own dad "Papa." So even though fishing was never one of our past times, I still felt a certain kinship with the little girl in the story. Even though all of these books refer to "dad" or "father" or "papa," each of them could easily be adapted to uncles or grandpas or friends or whoever fills that special place in your life. OMG I love love the last one. My husband is a fisherman and he can't wait to take Baby Whimsy fishing. I see this as a future father's day gift. I have a board on Pinterest full of your posts. It's called Raising a Bookworm. :) I love your posts like this so much. Oh wow, I have to get the Margaret Wise Brown book! Thanks for sharing these! 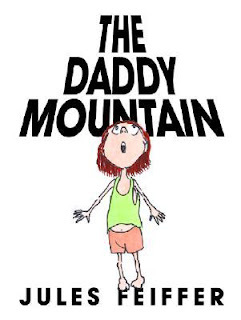 "The Daddy Mountain" sounds so fun. Great reviews, as always. One of my favorite father books is Dan Yaccarino's Every Friday, about how a father and his son spend every Friday morning before work together as a special ritual. Thanks for the suggestion, Erica! I must check out that one! Speaking of dads in picture books--what is your opinion of the Berenstain Bears? I always thought they were great, but Curtis doesn't like them because he says they make Papa look like an idiot...which I can't really argue with (not that dads are idiots, but that Papa Bear does look like one an awful lot...exhibit A, The Bears' Picnic, ex. B, The Missing Honey). And he doesn't want the kids to get a subliminal message that dads are stupid! Ooooh, what a tricky question! I happen to love The Berenstain Bears (pre-1990, that is), but I can see where Curtis is coming from. I think the difference for me is that even though Papa Bear is silly and ridiculous at times, he is still an authority figure and, more importantly, Brother and Sister Bear still treat him with respect. In fact, lots of times when he's doing the stupidest things, they are giving him the most genuine compliments. So in that way, I feel that his actions add an element of humor without teaching children to disrespect adults.